Theremin World - Dreaming of a White (Stripes) Christmas? Dreaming of a White (Stripes) Christmas? On the odd chance that someone on your holiday shopping list is a fan of the White Stripes and theremins, we have the perfect gift for you! 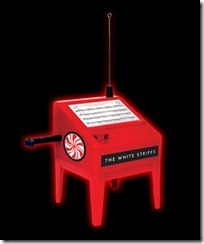 The White Stripes have announced a limited edition run of customized Gakken mini theremin kits. The kits run $49.50 USD plus shipping, and international orders are accepted. Less than 1000 were made, and orders are limited to 3 per person, so hurry before they run out! If you end up with one of these and find yourself hungry for more, be sure to read through the available Gakken theremin mods and consider hot-rodding this little guy. If you’re wondering about the connection… perhaps this demo by Jimmy Page was the beginning of Jack’s interest in the theremin?